L (when doubled) = 265 mm, Diam shell beads 4 to 8 mm, Diam barrel-shaped beads = 5.5 mm, L barrel-shaped beads 5 mm, Diam cylindrical beads = 4 to 5 mm, L cylindrical beads 4 to 5 mm [RTS 25/5/2004]. Although described in the accession register as three strings of beads tied together, it would appear that this object consists of one single long string of beads that has been coiled into three loops, which were then fixed together at a single point at the top. The beads are too tightly strung to allow the material of the cord to be seen clearly, but the tie itself may be of animal hide, although this area is coated with an unidentified dark brown substance, probably mud or dung, and also cannot be clearly seen. The majority of beads appear to be made of white to light grey shell - possibly Achatina - cut into thin discs that are round to oval in plan view. These gradually decrease in size from one end of the necklace to the other. It would appear that some of these discs have become stuck together to form larger groups; these are not consistent in the number of beads per group, and may have become attached naturally rather than by intent. There are probably between 600 and 700 white disc beads on the necklace; in addition to these, the two original end pieces have been strung with a series of opaque coloured glass beads. On one end, these consist of 12 white and 3 deep blue beads (Pantone 288C); on the other side are 18 green (Pantone 346C and 359C), 2 purplish grey (Pantone 2706C), 1 white and 1 red bead (Pantone 178C), with a final bead completely covered by the dark brown substance mentioned earlier. The green beads take the form of short cylinders, while the other beads have more convex sides and barrel-shaped bodies. 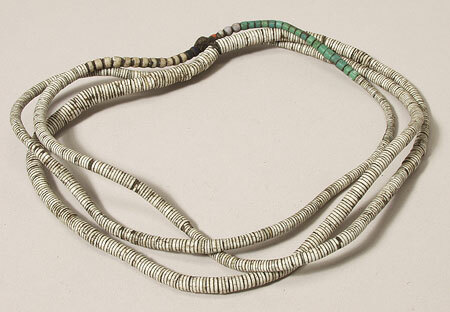 The necklace appears to be complete, with a fair amount of surface dirt adhering to the tie area and between most beads. The length of the necklace as strung is 265 mm; the shell beads range from 4 to 8 mm in diameter, and 1 to 2 mm in thickness; the barrel-shaped beads have a diameter of 5.5 mm and a length of 5 mm, while the cylindrical beads have diameters ranging from 4 to 5 mm, and lengths of 4 to 5 mm. The complete necklace weighs 124.9 grams. This object was collected by Brian John Mack when working amongst the Toposa in the Southern Sudan in 1980. It appears to have been accessioned retrospectively as part of Patti Langton's collection later that year, using the same group number assigned to material from her 1979 expedition, which Mack had been a part of. However his 1980 fieldwork appears to have been undertaken independently of Langton, although she was working amongst the nearby Boya at the same time (pers. comm. John Mack 8/10/2004). Discussions of the Toposa may be found by Captain G.R. King in L.F. Nalder (ed. ), 1937, A Tribal Survey of the Mongalla Province, pp 65-81 and A.C. Beaton, 1950, "Record of the Toposa Tribe", Sudan Notes and Records XXXI . The shell used to make these beads is probably Achatina, a species of gastropod; the three main varieties are Achatina fulica (East African land snail), Achatina marginata (West African Land Snail) and Achatina Achatina (Tiger Snail). The Achatina fulica is the smallest of these, with a shell 3-4 inches in length (Source: http://exoticpets.about.com/cs/rarespecies/p/landsnails.htm). The green cylindrical beads are of the same type seen on 1979.20.154, from the Northern Larim. Accession Book Entry [p. 185] - 1979.20 (.1 - 206) P[urchase] MISS PATTI LANGTON, DEPT. of ETHNOLOGY & PREHISTORY, OXFORD. Collection made by Patti Langton during the British Institute in East Africa's expedition to the Southern Sudan; Jan. - April 1979. The collection was made in three culture areas during the dry season. The amount paid for each object is listed if the information is known. In Jan. 1979 £1 is equivalent to 95 piastres (pt.) Sudanese. This documentation is based largely upon Patti's own list of objects and her notes on these. Sometimes objects included in the Pitt Rivers alottment of the collection do not appear on her list and have been added here. See Related Documents file as well. [p. 214] 1979.20.194 - SOUTHERN SUDAN TOPOSA Collected in 1980 and sent via John Mack, Mus. of Mankind [p. 215] 1979.20.206 Three strings of shell discs and some colored [sic] beads; tied together by leather strings. Max. L. when doubled = 28 cm. [right hand column initialled one line below entry] L.B.W. Additional Accession Book Entry [below accession number in red biro] - A6-F25-10. Sparks, Rachael. "Toposa ornament" Southern Sudan Project (in development). 03 Jan. 2006. Pitt Rivers Museum. <http://southernsudan.prm.ox.ac.uk/details/1979.20.206/>.